DVT ultrasound fails too – Is it enough to detect real disease? Author: Dr. Christine Butts – The director of the division of emergency ultrasound and a clinical assistant professor of emergency medicine at Louisiana State University at New Orleans. I was really spooked by a recent article in the Journal of Emergency Medicine reporting a missed diagnosis of deep venous thrombosis (DVT). A young, healthy patient presented to the ED complaining of unilateral leg swelling. She was evaluated on her initial visit with a radiology-performed lower extremity ultrasound, which was negative. “I wondered back then how many of us were using ultrasound inappropriately, relying on it alone to rule out DVT. Obviously, no test is perfect. The usefulness of a test is often not straightforward; instead it’s a combination of terms we may not think about much, like sensitivity and prevalence. For most of us, when we think DVT, we think ultrasound, irrespective of its shortcomings. I get a variety of responses, most of them negative, when I bring up D-dimer with my residents. Best-case scenario, they groan in protest. Worst case, they say, “I know it’s going to be positive.” Regardless of its perception, D-dimer remains a component of algorithms in diagnosing DVT. Most studies on limited compression ultrasound (in comparison with whole leg compression, which is much more extensive) include clinical probability and a measurement of D-dimer. (New Engl J Med 2003;349:1227.) Recently, we had a case in our ED that seemed, like the case above, to strengthen the argument not just for ordering the D-dimer but also for considering further action beyond ultrasound. A 53-year-old man presented to the ED for evaluation of a possible DVT. He reported swelling and pain to his right lower leg. No recent immobilization or surgery was noted. An exam at the time of his initial visit revealed swelling to the right calf with tenderness to palpation. The remainder of the exam was unremarkable. A limited compression ultrasound alone was done at that visit, which was negative, and the patient was discharged with pain control. No D-dimer was drawn. The patient returned a week later complaining of persistent pain and swelling. The exam at that time revealed edema and tenderness to palpation to the right lower leg as well as erythema. A repeat limited compression ultrasound was negative for DVT. A D-dimer was ordered, which was significantly elevated. The evaluating team ordered a CT with contrast of the lower extremity, primarily concerned about possible deep space infection. CT demonstrated a calf DVT with no other significant findings. The patient was started on oral anticoagulation and discharged home without further incident. The patient in this case was likely to have a DVT based on his initial clinical presentation. By this designation (and the algorithm referenced above), a limited compression ultrasound and a D-dimer would have been appropriate. 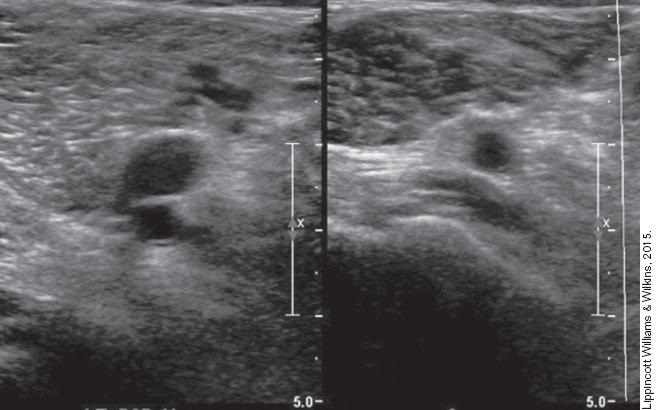 If the original D-dimer had been positive, which I suspect it would have been, repeating the ultrasound after one week would have been appropriate. The real sticking point in this case was the second negative ultrasound in the face of high clinical suspicion and a positive D-dimer. Ultimately, and possibly surprisingly, CT made the diagnosis in this case when ultrasound failed.